Limited Edition Blood Sand Hour Glass, featuring lyric from the MCR song "Our Lady of Sorrows." Filled with blood red sand, the immortality hourglass counts down to forever. Housed in a custom black MCR display box, the wooden frame keeps hold of the hour glass of deep scarlet sand. Exclusive to MyChemicalRomance.com, there are only a limited number of these hour glasses available, and once they've gone, they are gone for good. 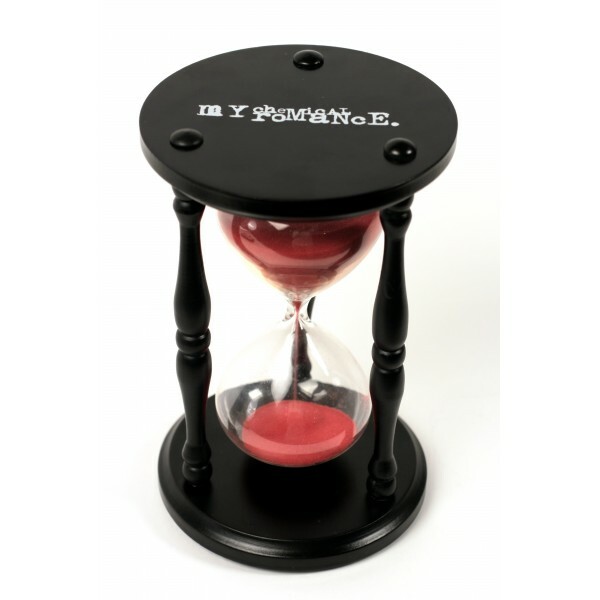 Limited Edition Blood Sand Hour Glass, featuring lyric from the MCR song "Our Lady of Sorrows." Filled with blood red sand, the immortality hourglass counts down to forever. Housed in a custom black MCR display box, the wooden frame keeps hold of the hour glass of deep scarlet sand. Exclusive to MyChemicalRomance.com, there are only a limited number of these hour glasses available, and once they've gone, they are gone for good.